A rare subset of HIV-infected individuals, designated viremic non-progressors (VNP), remain asymptomatic and maintain normal levels of CD4+ T-cells despite persistently high viremia. To identify mechanisms potentially responsible for the VNP phenotype, we compared VNPs (average >9 years of HIV infection) to HIV-infected individuals who have similar CD4+ T-cell counts and viral load, but who are likely to progress if left untreated (“putative progressors”, PP), thus avoiding the confounding effect of differences related to substantial CD4+ T cell depletion. We found that VNPs, compared to PPs, had preserved levels of CD4+ stem cell memory cells (TSCM (p<0.0001), which was associated with decreased HIV infection of these cells in VNPs (r = −0.649, p = 0.019). In addition, VNPs had decreased HIV infection in CD4+ central memory (TCM) cells (p = 0.035), and the total number of TCM cells was associated with increased proliferation of memory CD4+ T cells (r = 0.733, p = 0.01). Our results suggest that, in HIV-infected VNPs, decreased infection of CD4+ TCM and TSCM, cells are involved in preservation of CD4+ T cell homeostasis and lack of disease progression despite high viremia. Here we assessed correlates of protection from disease progression in a rare subset of HIV-infected individuals, viremic non-progressors (VNP). These individuals have high viral load for several years. 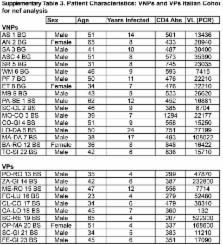 In contrast to the majority of infected individuals, however, these individuals do not progress to AIDS. Here we found this lack of progression was associated with selective preservation of two critical subsets of memory CD4+ T cells, central memory (TCM) and stem-cell memory (TSCM) cells. Compared to HIV-infected putative progressors, VNPs had higher proliferation of these indispensable subsets of memory cells. In addition, the long-lived CD4+ TCM and TSCM cells in VNPs had decreased HIV infection compared to the less critical effector memory CD4+ T cells, which indicates a possible mechanism by which VNPs maintain their CD4+ T cell pool after several years of infection, and remain free from AIDS progression. HIV persists in a reservoir of latently infected CD4(+) T cells in individuals treated with highly active antiretroviral therapy (HAART). Here we identify central memory (T(CM)) and transitional memory (T(TM)) CD4(+) T cells as the major cellular reservoirs for HIV and find that viral persistence is ensured by two different mechanisms. HIV primarily persists in T(CM) cells in subjects showing reconstitution of the CD4(+) compartment upon HAART. This reservoir is maintained through T cell survival and low-level antigen-driven proliferation and is slowly depleted with time. In contrast, proviral DNA is preferentially detected in T(TM) cells from aviremic individuals with low CD4(+) counts and higher amounts of interleukin-7-mediated homeostatic proliferation, a mechanism that ensures the persistence of these cells. Our results suggest that viral eradication might be achieved through the combined use of strategic interventions targeting viral replication and, as in cancer, drugs that interfere with the self renewal and persistence of proliferating memory T cells. Shorter survival in advanced human immunodeficiency virus type 1 infection is more closely associated with T lymphocyte activation than with plasma virus burden or virus chemokine coreceptor usage. Conceived and designed the experiments: NRK MML BJ DC CT MPa JMB FK PWH GS. Performed the experiments: NRK SEB AH JT LERS JPG. Analyzed the data: NRK SEB AH MPe MPa LERS JPG NP. Contributed reagents/materials/analysis tools: MML BJ DC CT JNM SGD ES FMH FK. Wrote the paper: NRK SEB AH FK PWH GS. This work was supported by: the Hector Foundation and the Deutsche Forschungsgemeinschaft (Leibniz award to FK), and NIH/NIAID grants P01 AI 076174 (Cleveland Immunopathogensis Program), R01 AI110334 (MPa), K22 AI098440 (NRK) and in part by University of Washington Center for AIDS Research, P30 AI027757 and University of California San Francisco Center for AIDS Research, P30 AI027763 and R24 AI067039. The funders had no role in study design, data collection and analysis, decision to publish, or preparation of the manuscript. Dysfunctional Epstein-Barr virus (EBV)-specific CD8(+) T lymphocytes and increased EBV load in HIV-1 infected individuals progressing to AIDS-related non-Hodgkin lymphoma. Association between peripheral γδ T-cell profile and disease progression in individuals infected with HIV-1 or HIV-2 in West Africa.